The Place Another new restaurant addition to Orchard Road at Robinsons The Heeren is the eponymous restaurant Angela May Food Chapters, a collaboration between the Deliciae Hospitality Management group (which runs restaurants like &Made Burger Bistro, Sabio and L’Entrecote) and Angela May, a renowned American-Thai Culinary Host and TV Presenter. The 60-seater restaurant takes up a corner space at level 2 of the department store, with a contemporary and cosy touch to its interior which makes me feel like a semi-retreat in the bustling Orchard Road. It helps that you get a good view of Orchard Road if you managed to snag a table by the window, otherwise I also like it that there are some kind of greenery at the backdrop of the restaurant. The Food I was attracted to the counter the moment I stepped into the restaurant, with neat displays of its pastries, desserts and cookies. The concept at Angela May Food Chapters is a focus on healthier ingredients in its dishes without compromising on taste, especially the role of vegetables. With Angela’s Thai, American and Singaporean influence, do expect to see touches of each region’s cuisine in her dishes. A quick glance of the menu reveals dishes such as the Caramelized Cauliflower Steak ($22), Charred Pork Collar ($39) with Mint Pomelo Salad, over White Beans and Soy Glazed Shiitake & Cold Scallion Noodles ($18) with Pickled Cucumbers. You get the drift. Beware of the time to visit the restaurant as the all-day restaurant has different menus at different time of the day. The breakfast menu is from 10.30 to 12pm, featuring dishes such as French Toast ($18) with House-made Olive Oil Bread & Fresh Berry Compote and Suckling Pork over a Wheat Berry Bowl ($22) with Poached Egg & Puffed Rice, High Brunch Set from 10.30am to 2pm, High Tea Set from 2pm to 5pm, and its À la carte menu from 12pm to 9.30pm. We went for the High Brunch Set ($39) which sounds like a hybrid between high-tea and brunch, but not quite the usual fares. For the savoury bits, the two-tier set offers bites of Chef’s Selection of Choux from the pastry counter, Gula Melaka Glazed Brioche Pull-apart bread, French Toast with House-made Olive Oil Bread & Fresh Berry Compote. On to the healthier bits, we had the Chilled Coconut Chia Pudding with Fresh Berries, House Special Granola of the Month with Yogurt & Fresh Fruit and Compote Passionfruit Tea Shooter with Chia & Pomegranate Seeds. The set is complete with some Angela’s Cookie Selection and a choice of Coffee or Tea. Overall, the High Brunch Set does try to offer a balanced combination even though I think the items can be more substantial in terms of portions and variety, given the price tag. A quiche or croissant will be a nice addition to have – for now, I find the set slightly overpriced. From the À la carte menu, the Josper Grilled Laksa Prawn ($29) with Laksa Yogurt Sauce shouts out to us, and I was curious how a laksa prepared with yogurt sauce instead of coconut milk will turn out. 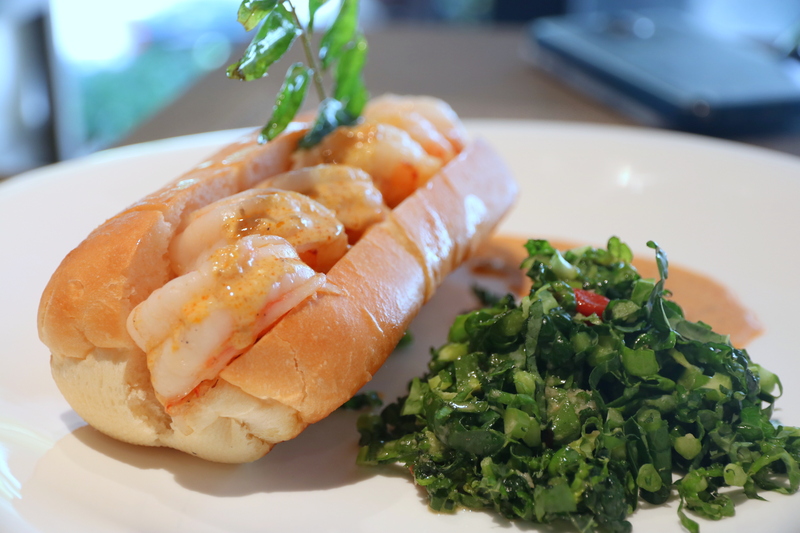 I was expecting a bowl of laksa but what greeted us was a plate of prawns on brioche drizzled with laksa sauce. Interestingly, I could not taste any hint of yogurt in the laksa sauce. The brioche was slightly crisp, while the fresh prawns had absorbed the essence of the laksa sauce. Serving wise, I wished it could be a bigger portion. Rants I do wish that the breakfast menu can be extended longer, a mere 1.5 hours in the morning to order from this menu is too short. Will I Return Again? I love the space at Angela May Food Chapters, definitely one of those cosy spots to have an intimate gathering in town. You do have to pay it up for the ingredients and concept here though, which no doubt explains the above average prices of the items across the menu. Make your reservation instantly at Angela May Food Chapters here.